Tiffany's Online Finds and Deals: Awesome Toy sale at Target! Awesome Toy sale at Target! Target.com has an Amazing toy sale going on. $10 OFF $50 and $25 OFF $100. Target also has some of the hottest Christmas toys of 2017 on sale. Combine these 2 deals for amazing savings! furReal Roarin' Tyler - the playful Tiger ON sale for ONLY $92.99-$10=$82.99! Teddy Ruxpin - The Storytelling and Magical Bear $99.99-$10= $89.99 add a cheap filler toy to save $15 more! Teddy Ruxpin is more lovable than ever before, and brings magic and friendship to story time with interactive technologies and features! He enjoys telling tales and singing songs with friends ages 2+, making him the perfect companion. Teddy Ruxpin is embedded with innovative technologies which include color, electronic LCD eyes that react in fun and surprising ways as he tells tales and sings songs. There are more than 40 full-color eye expressions and animations that sync to Teddy Ruxpin's emotional state as he takes you on exciting storytelling adventures. Teddy Ruxpin’s motorized mouth with TalkSync Technology moves whenever he speaks or sings. Children can start, pause or move on through the stories, using the easy-to-use touch sensors in each of Teddy Ruxpin’s paws. Want to fast forward through Teddy Ruxpin’s story? Just touch the Teddy Ruxpin logo on his vest. Teddy Ruxpin is Bluetooth-ready, enabling him to quickly sync with the exclusive Teddy Ruxpin app on any smart device. There are two convenient and fun ways to play! Mode #1 - use the free Teddy Ruxpin app to help new readers advance their reading abilities; view digital books to read along with Teddy Ruxpin on any enabled device! Mode #2 - when a device isn't available, kids can enjoy listening to Teddy Ruxpin's stories without the app! This Target exclusive Teddy Ruxpin is wearing a special outfit inspired by the original 1985 bear and comes with five original stories already unlocked with purchase – The Airship, All About Bears, Captured by Mudblups, Teddy Ruxpin Lullabies & The Missing Princess! There are five additional stories available to purchase and unlock in the Teddy Ruxpin app. With so much fun packed into this fluffy 14-inch toy, Teddy Ruxpin is the ideal travel companion for everything from road trips to visits with grandma. And remember, you don't need a Wi-Fi connection to access your unlocked stories and songs, so Teddy Ruxpin is the perfect pal for story time fun–anytime, anywhere! My Little Pony The Movie My Magical Princess Twilight Sparkle ON SALE for $87.99- $10= $77.99! 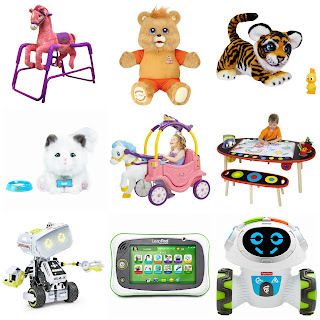 REG $129.99 ADD $12.01 in more toys to save an extra $15! Includes pony figure, tiara, and instructions. L.O.L. Surprise! Big Surprise $59.99-$10= $49.99! 119.98 - 25= $94.98 or $47.49 each! on sale for $114.99 - $25= $89.99 REG $149.99! • The future is here and it’s ready to play! Meet M.A.X, the 12” tall advanced robot featuring both artificial intelligence and customizable programming. • M.A.X comes with built-in infrared sensors, to help it sense obstacles and navigate surfaces as it rolls around on sturdy smart wheels. • Challenge young minds with this S.T.E.M robotics toy. Perfect for budding engineers, builders and visionaries, M.A.X requires kids to engage in critical thinking. • M.A.X is a robotics toy recommended for kids aged 10+. Intermediate complexity level. Build time of 1-3 hours. Movi says, "Let's Play!" This cool little robot is ready to roll, and get kids moving and learning along with him! With 360 degrees of mobility, Think & Learn Teach 'n Tag Movi encourages preschoolers to get their minds and bodies moving while teaching them how to follow directions and think critically about the world around them! With three exciting game modes, Movi keeps kids thinking (and moving! ), whether he's asking them questions to engage their critical thinking skills, prompting them to follow directions to a fun game, or getting silly on the dance floor and showing off his smooth moves. Kids will have a blast showing off their awesome listening skills and rockin' moves with this interactive learning robot! Where development comes into play Following Directions: With active games like "Red Light, Green Light" or "Movi Says", preschoolers practice their listening skills and following directions. Critical Thinking: When Movi asks kids to think about an object and asks what shape that object is, he's encouraging them to use those all-important critical thinking skills! Movement & Motions: Whether it's an all-out dance party or pretending to be different animals, Movi gets your preschooler up and moving! For ages 3 to 6 years. • Teach 'n Tag Movi can move here, there & everywhere—360 degrees of mobility! • See Movi’s facial expressions change during play—60+ different faces! • Teaches preschoolers following directions, critical thinking skills & gets them up and moving! Little Live Pets Cuddles My Dream Kitten $54.99 - $10= $44.99! Say hello to "Cuddles - My Dream Kitten!" The adorable Little Live Pet who moves and acts just like a real kitten! I purr when I'm happy. Scratch my cheek and I'll cuddle you! My tail moves just like a real kitten. My Dream Kitten make the perfect first pet for your child. They will fall in love with it the minute your kitten opens its eyes! This kitten is so lifelike they will truly connect as your child learns to nurture and care for their new pet! My Dream Kitten even comes with an adoption certificate so that they can truly make him their own! Encourage your budding artist's creativity with the Alex Super Art Table. This table includes a built-in paper roll so it's easy to move on to a new art project. The two chairs and large table surface allow a young artist to share with a friend. Rockin' Rider Melody Plush Spring Horse sings the exclusive "I'm a Little Pony" song when her right ear is pressed and says 6 fun talking phrases with sound effects when her left ear is pressed. The soft and huggable plush is preferred by both Moms and Kids. Other features include 3-position stirrups, easy-grip handles, realistic mane and tail, detailed colorful saddle, embroidered eyes, sturdy steel frame and durable spring covers. Parents can select the volume level that's right for their home. Some assembly is required. Saddle height is 26 inches. Requires 2 AA batteries. Melody is recommended for ages 2 to 5 years and up to 65 lbs. LeapFrog LeapPad Ultimate Kids Learning Tablet $99.99 add a cheap filler toy to save $25! Designed just for kids, LeapPadTM Ultimate is the perfect kid-safe learning tablet. This tablet includes $110 worth of games, apps and videos so kids can learn and play right away. They’ll also have access to a library of content including award-winning apps and cartridges featuring kids’ favorite characters. Exclusive Just-for-MeTM learning technology is built into many of the learning games, assessing your child as they play and automatically adapting the curriculum to a more or less challenging level to keep kids engaged and motivated. The tablet is kid-safe right out of the box, with a kid-friendly web browser that provides access to pre-selected websites all approved by learning experts. It also includes a built-in bumper, reinforced design and shatter-safe screen. Parental controls allow parents to add multiple kids to one tablet and set play time limits. LeapPadTM Ultimate is ready to prepare your child for preschool and beyond! Laser X is a Real Life Laser Gaming Experience. Set includes everything you need for 2 Laser X players. • Blast your opponent’s Receiver Vest from up to 200’ away. • Full Color Lighting Effects let you keep track of shots and hits. • Interactive voice coach gives tips feedback during the game. • Plug in headphones and hear the Laser X Soundtrack and Sound Effects. • Compatible with all other Laser X sets. • Play as teams or as individuals.